Help Us Get Through 2018 By Becoming A Sustainer! Please include Crescendo Young Musicians Guild in your year-end giving. Make a tax-deductible donation today, and help us continue to provide free and low-cost music programs! Watch CYMG Founder Pin Chen and some students in this Jump Shipp episode that chronicles how Ms. Chen came to found Crescendo Young Musicians Guild! 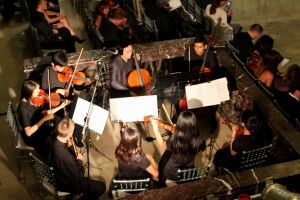 CYMG Chamber Strings students ended their summer workshops by performing at a beautiful wedding in Downtown Los Angeles. The students played for 45 minutes before the ceremony, for the processional, and the candle-lighting ceremony. The students had a wonderful experience. For most of them, it was their first time performing at a wedding! Great job!! Click on the image to view more pictures from the event and from their rehearsals! Thanks to Jesi, Amin, and all the people who did interviews for the video! Crescendo Young Musicians Guild is a 501(c)(3) non-profit music education and community service organization that provides quality music instruction, mentoring and performance opportunities to students who may otherwise not have them. CYMG promotes a spirit of service while bringing students and families of all cultural and socio-economic backgrounds together to work toward a common goal: to enrich their communities through music. Thank you for your interest in reaching young people and the community through music! If you are interestedin supporting CYMG in any way, whether it be with your time, talents, resources, connections, or monetarily, and/or you would like to stay updated through our email list, please email your contact information to info@cymg.org.